"I am calling these Russian because of my use of beets in the recipe. 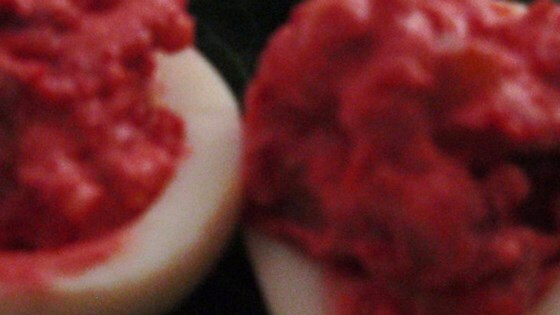 One day when I decided to make deviled eggs for the first time, I had made a beet salad that my mom taught me. This was just grated boiled beets mixed with mayonnaise and fresh garlic. I decided to use this instead of just plain mayo. And from here, my recipe was born! Hope you like it." Place beet in a small saucepan with water to cover; bring to a simmer and cook until tender, about 15 minutes. Drain and cool. Grate beet on medium holes of a grater. Place grated beet in a bowl; stir in mayonnaise, mustard, and relish. Cut each egg in half lengthwise; place egg yolks in a bowl. Mash egg yolks with a fork; stir beet mixture into egg yolks. Season with paprika, salt, and pepper. Place egg whites cut-side up on a serving platter. Spoon yolk mixture into egg white halves; top with cilantro. The prepared eggs may be made up to 2 hours in advance and kept refrigerated, covered with plastic wrap. I love the reddish purple color! The taste is wonderful! This was easy to make, so I'll be making these again! i made it exactly the same. but i didn't use the beet because i don't like it. but, overall it's quite an interesting recipe to try and a very simple yet delicate one too.